Data Showcasing Strength of RTI’s SImmetry® System in Sacroiliac Joint Fusion Published in <i style="white-space: nowrap">The Spine Journal</i> - RTI Surgical Holdings, Inc.
ALACHUA, Fla. – March 28, 2018 – RTI Surgical, Inc. (Nasdaq: RTIX), a global surgical implant company, today announced data on the SImmetry® Sacroiliac Joint Fusion System have been published in The Spine Journal, the official journal of the North American Spine Society. The study results demonstrate the SImmetry System produces effective joint fixation, markedly reducing range of motion (ROM) in the SI joint. The SImmetry System is the only minimally-invasive surgical procedure that uses proprietary decortication technology to help facilitate bone fusion, providing opportunity for long-term relief. 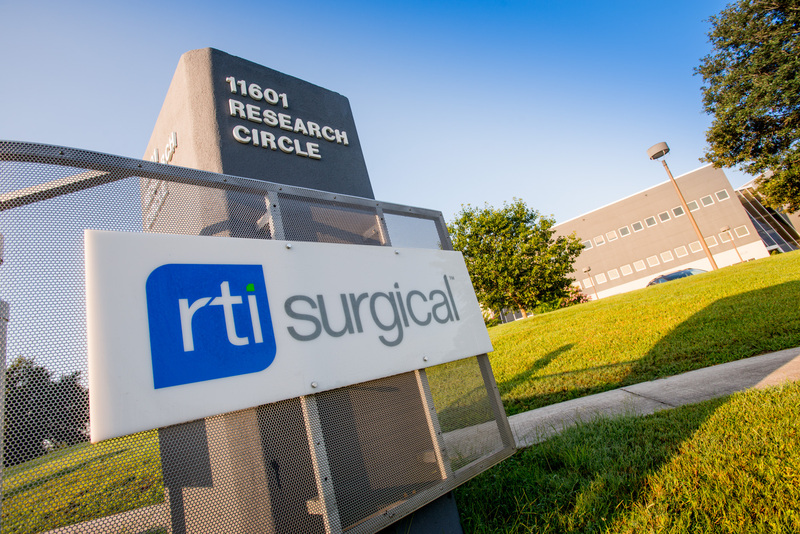 RTI Surgical recently acquired the SImmetry System as it continues to invest in advanced spinal surgery innovations supported by clinical data, including minimally-invasive technologies that ease the surgical experience and may help patient outcomes. The manuscript describes the results of a human cadaveric biomechanical study in which two minimally-invasive techniques for placing primary (12.5mm) and secondary (8.5mm) threaded implants were compared for their effectiveness in stabilizing the SI joint. The study also evaluated the link between fixation and bone mineral density, as well as the impact of removing the secondary implant on construct rigidity. Fourteen human cadaveric SI joints were prepared, grafted and then fixated using threaded SImmetry implants. Mechanical testing on the rigidity of the construct and ROM calculation was completed at the study initiation with the joint intact, after destabilization, after implantation, and after removal of the secondary implant. This biomechanics study found that the SImmetry implants provided a significant, 65-71 percent reduction in joint motion using multiple configurations of the implants. This benefit was maintained after repeated loading, and was greater than that seen in previous studies using triangular SI joint implants. The results provided evidence of immediate fixation, which is intended to relieve pain and provide an environment suited to bone growth across the joint, which is the ultimate goal in long-term relief of SI joint pain. These study results support the growing body of evidence on the effectiveness of the SImmetry System. The ongoing EVoluSIon Clinical Study is evaluating the impact of SImmetry on SI joint fusion and pain reduction in up to 250 patients at up to 40 sites. More than 180 patients have been enrolled to date. An early analysis of the first 50 patients published in December 2017 showed a 54 percent reduction in SI joint pain at six months as well as a 55 percent reduction in opioid use.i A separate CT fusion study on the SImmetry System demonstrated a 73 percent reduction in average pain over 24 months.ii Additional data from the EVoluSIon Clinical Study will be presented at the upcoming International Society for the Advancement of Spine Surgery (ISASS) 2018 Annual Meeting taking place April 11-13 in Toronto, Canada. iii Cohen SP et al. Sacroiliac Joint Pain: A Comprehensive Review of Epidemiology, Diagnosis and Treatment. Expert Rev Neurother. 2013; 13(1):99-116.
iv Snyder LA et al. The technological development of minimally invasive spine surgery. Biomed Res Int. 2014:293582.